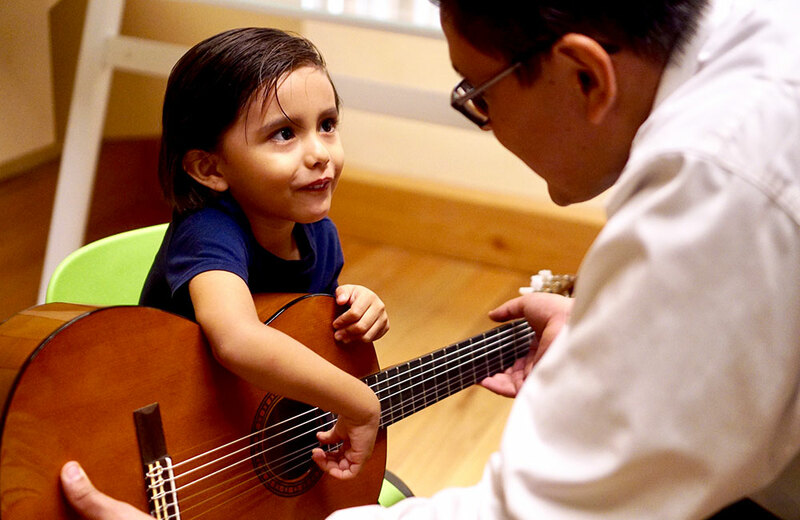 Benning Academy of Music seeks support for music education and training for the underserved. 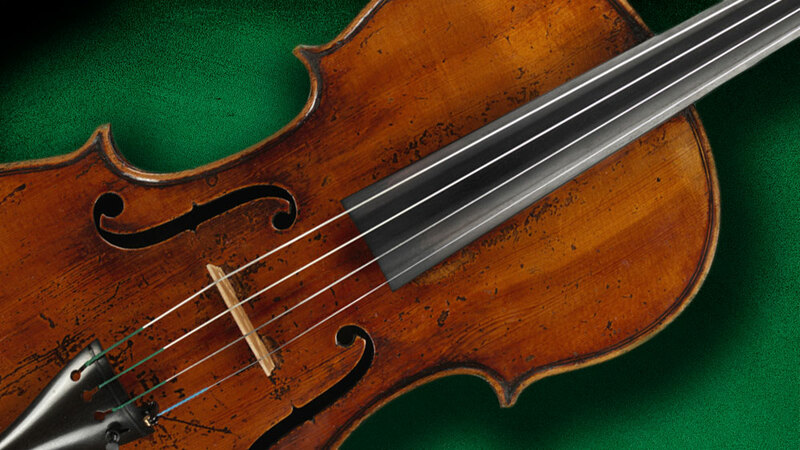 Preeminent violin shops Reuning & Son Violins and Benning Violins will host a five-day exhibit of rare violas crafted by old and modern Italian masters. 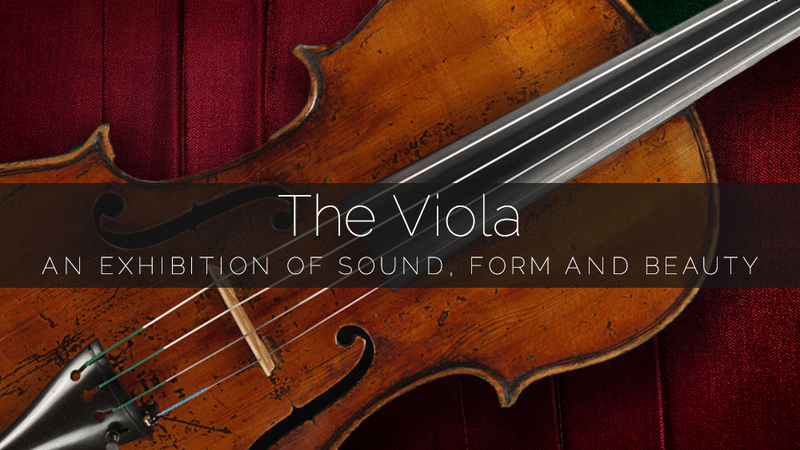 The exhibit coincides with the 2018 Primrose International Viola Competition held from June 12 to June 16 in Los Angeles. 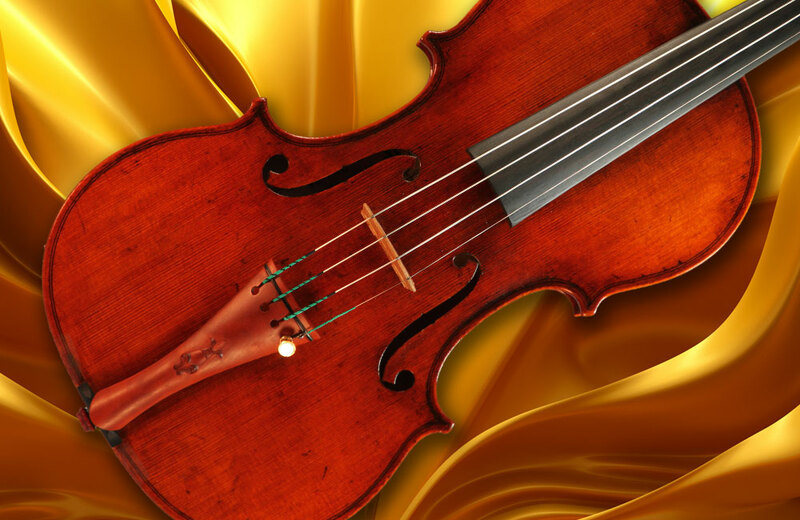 Appraisal and certificate services are offered by internationally-recognized expert during the Primrose Viola Competition. 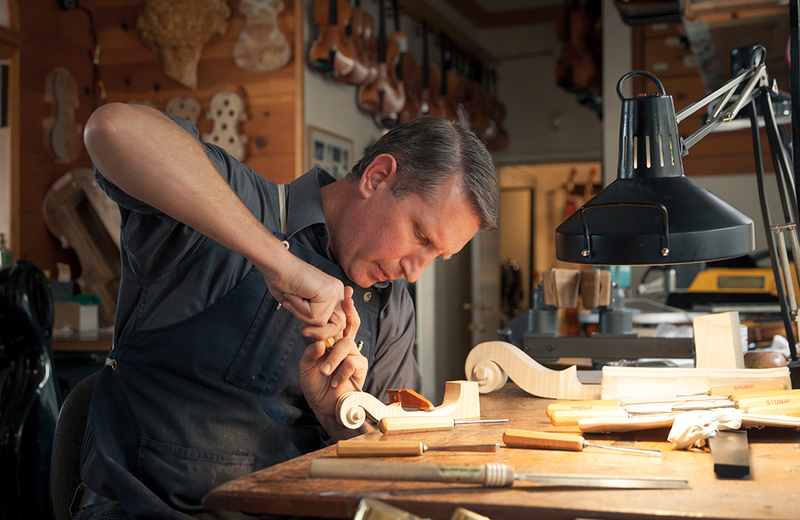 Distinguished violin maker and restorer Christopher Reuning will be accepting appointments for appraisals and certificates at Benning Violins on June 14th and 15th. 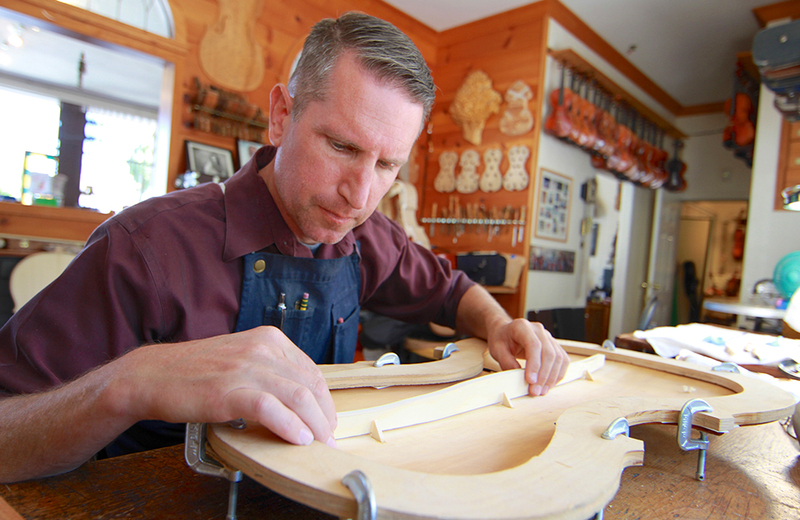 Preeminent Los Angeles violinmaker Eric Benning – in a wide-ranging interview – discusses the challenges and opportunities of pursuing his dream. 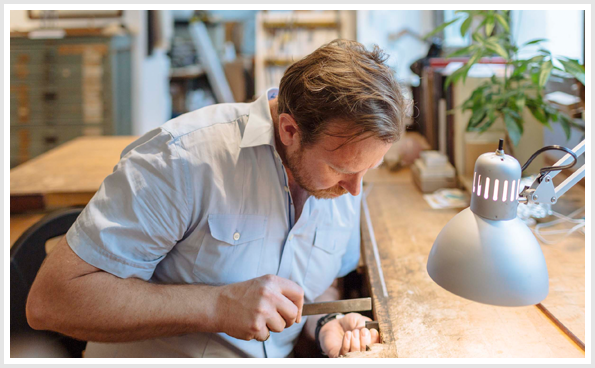 VoyageLA, one of LA's top media-driven online publications supporting the arts community, has recently interviewed Los Angeles-based violinmaker Eric Benning. 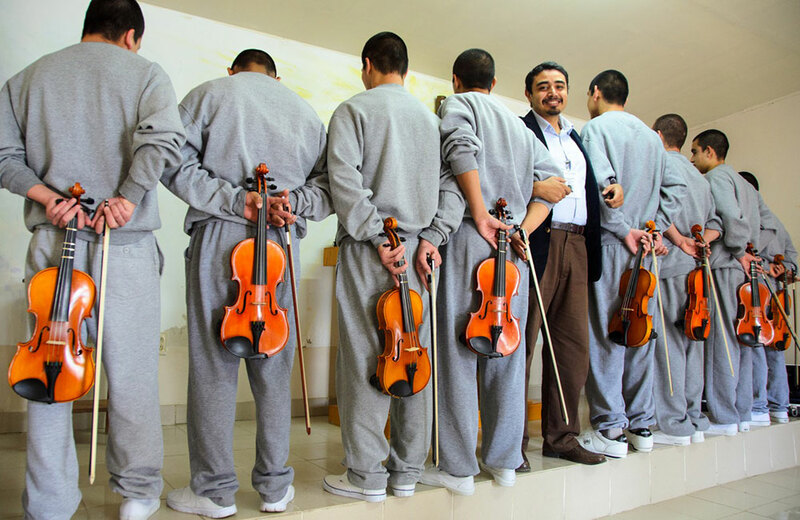 What happens when a preeminent violinist travels to a Mexican orphanage, a convent, and a prison, to name only a few places? Inspiration happens. 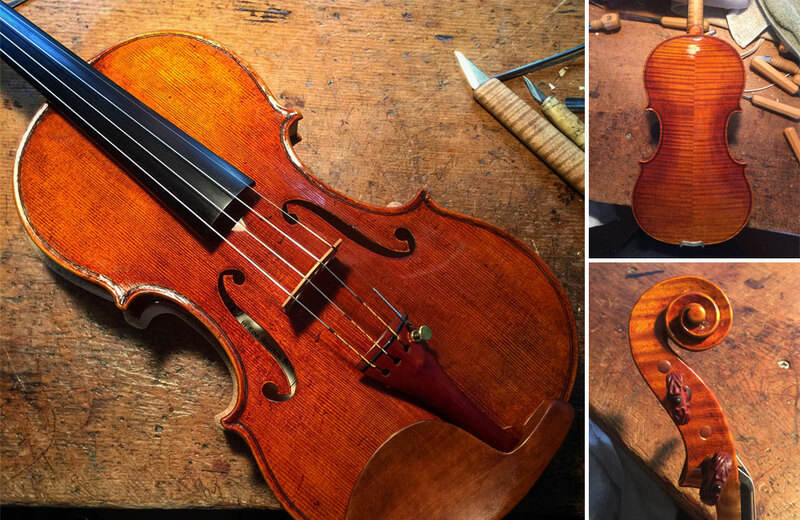 Renowned art blog features interview with Los Angeles-based violinmaker Eric Benning, “a rising star” in the Golden Age of Violinmaking. 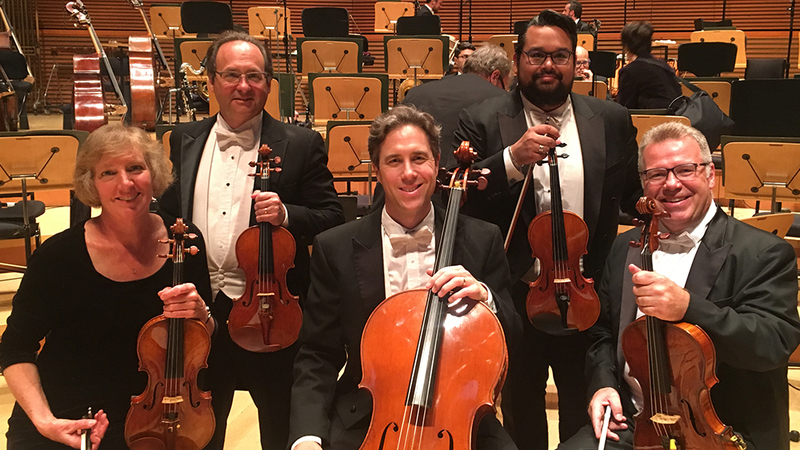 Distinguished violinist Mitch Newman, a member of the Los Angeles Philharmonic, has acquired a fine violin crafted by Los Angeles violinmaker Eric Benning. 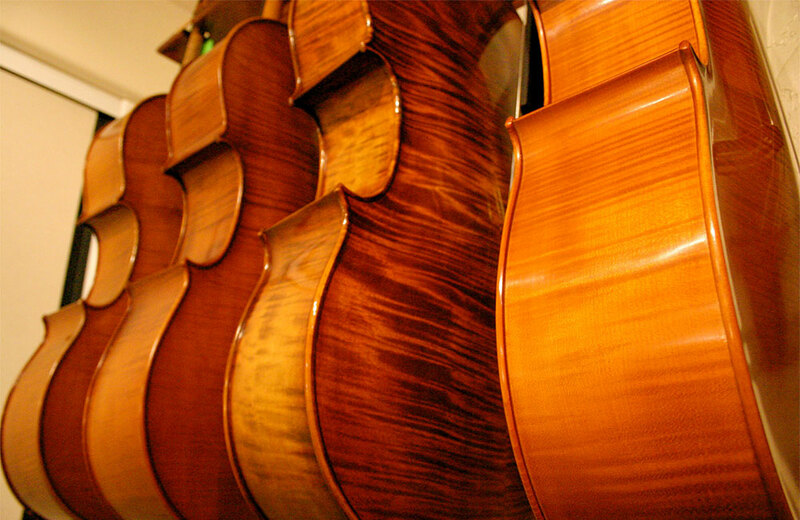 Los Angeles violinmakers, Benning Violins, will lend three fine cellos for performers' use at Fresno Cello Festival in October. 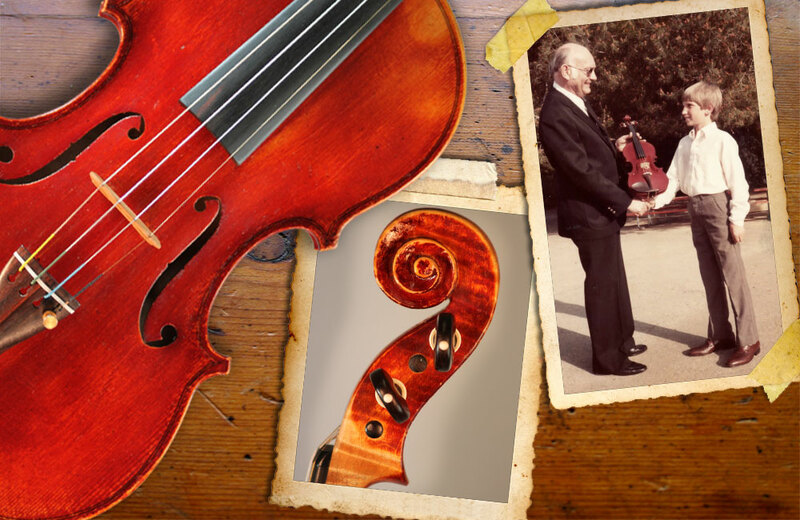 Prestigious Los Angeles violin shop Benning Violins has announced that it will be lending three master-crafted cellos to the Cello Fresno International Festival. 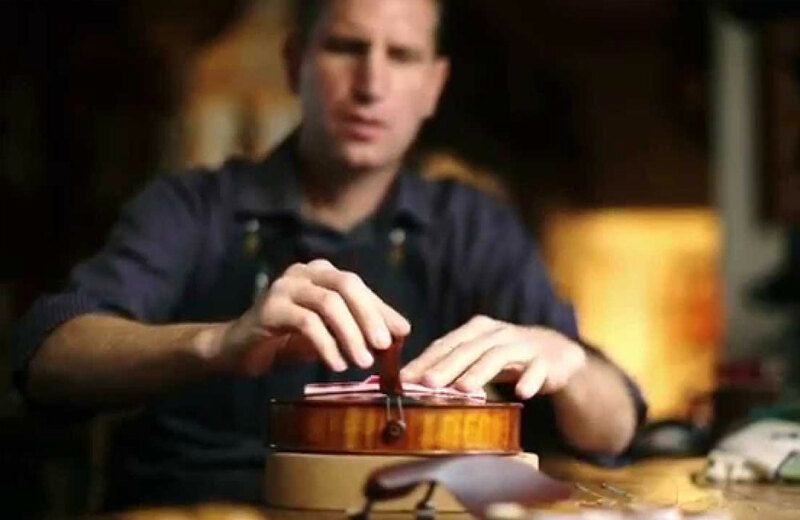 The violin, crafted by inventor Thomas Edison’s assistant and owned and played by a President Woodrow Wilson-appointed borough Postmaster, is an interesting piece of Americana. 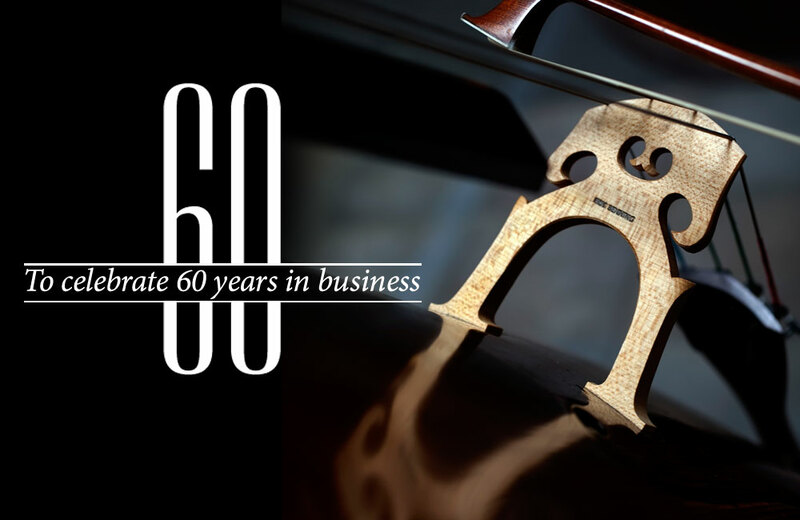 Benning Violins has announced that it will be lending for use eight master-crafted cellos and 5 fine cello bows to USC’s Piatigorsky International Cello Festival. 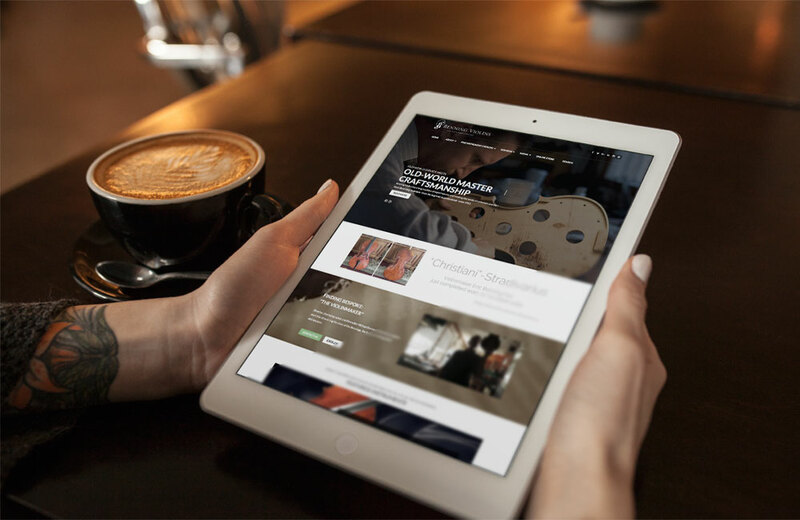 Benning Violins, a preeminent violin shop in Los Angeles, has launched a new, industry-leading website. 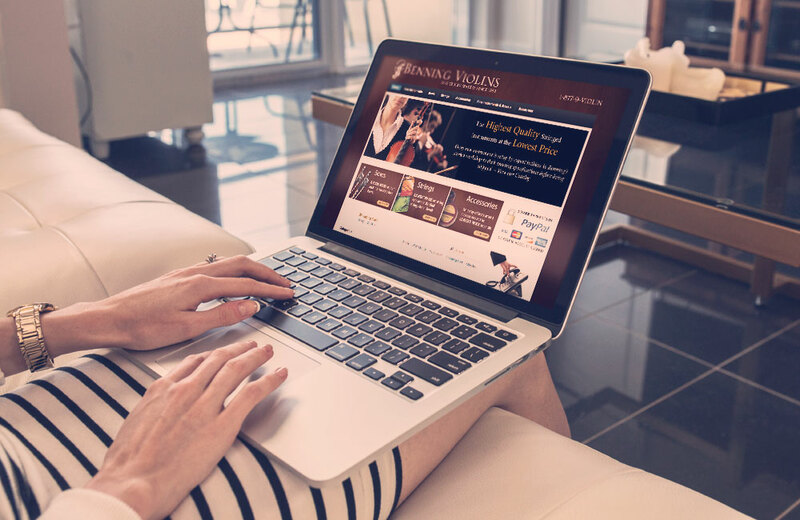 Launched in April, the state-of-the-art site showcases their catalog of fine violins, violas, cellos and bows crafted by both old and modern masters, as well as instruments made by resident violinmaker, Eric Benning. 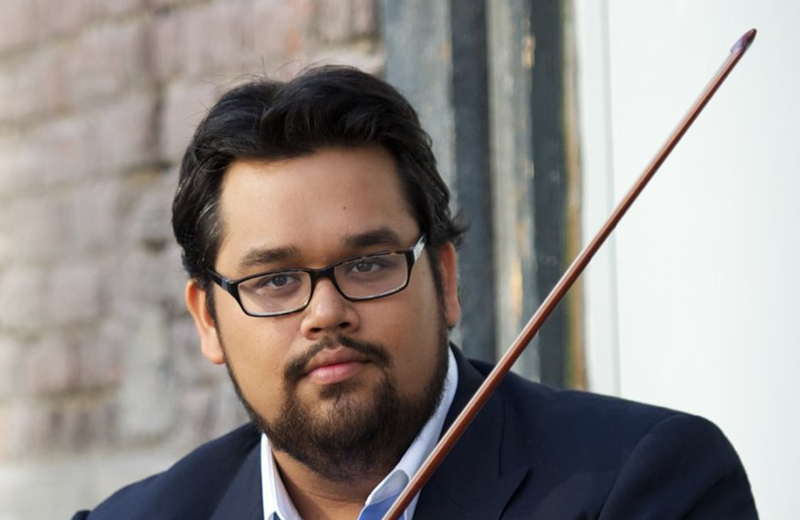 Critically renowned violinist, Vijay Gupta, has acquired a newly crafted violin by violinmaker Eric Benning. 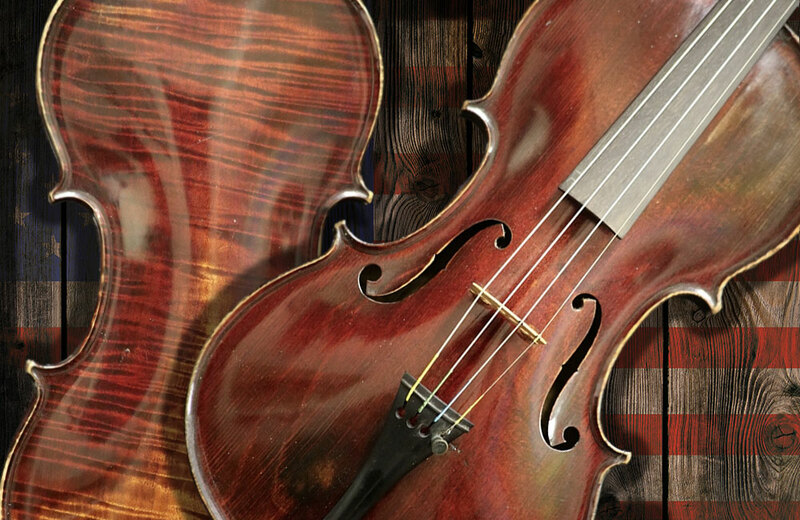 The instrument, modeled after a violin by Carlo Bergonzi, was completed in 2015 and is Benning’s 104th instrument. 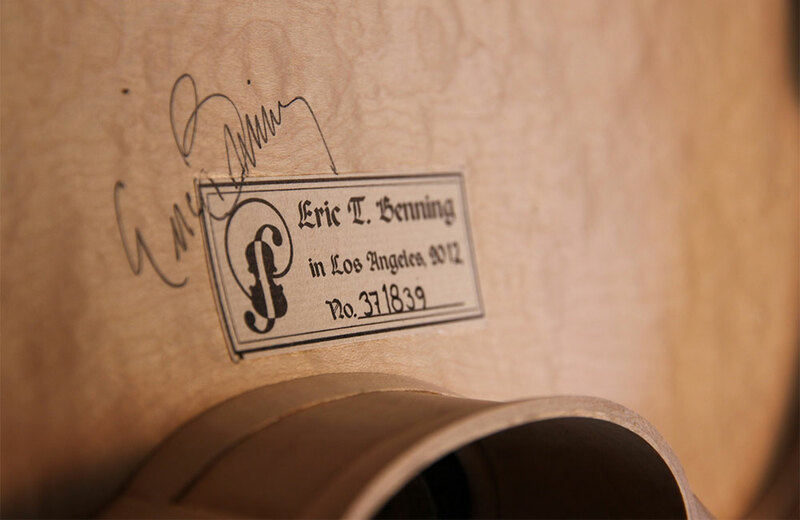 Of the many fine cellos Eric Benning has crafted in his Los Angeles violin shop, he was convinced this particular cello would be his last. 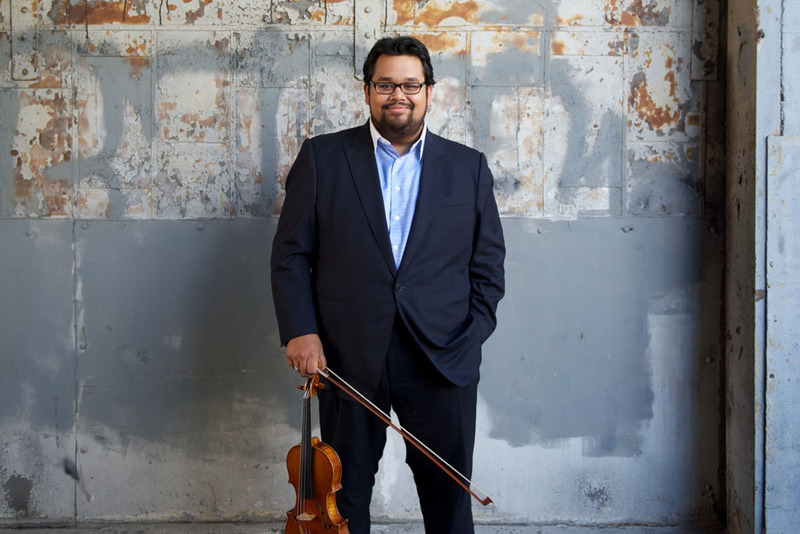 LA Philharmonic phenom and philanthropist Vijay Gupta acquires a Bergonzi-model violin crafted by violinmaker Eric Benning. Garrett Benning, eldest son of Los Angeles violinmaker Eric Benning, will be leaving the Los Angeles violin shop for the US Naval Academy. 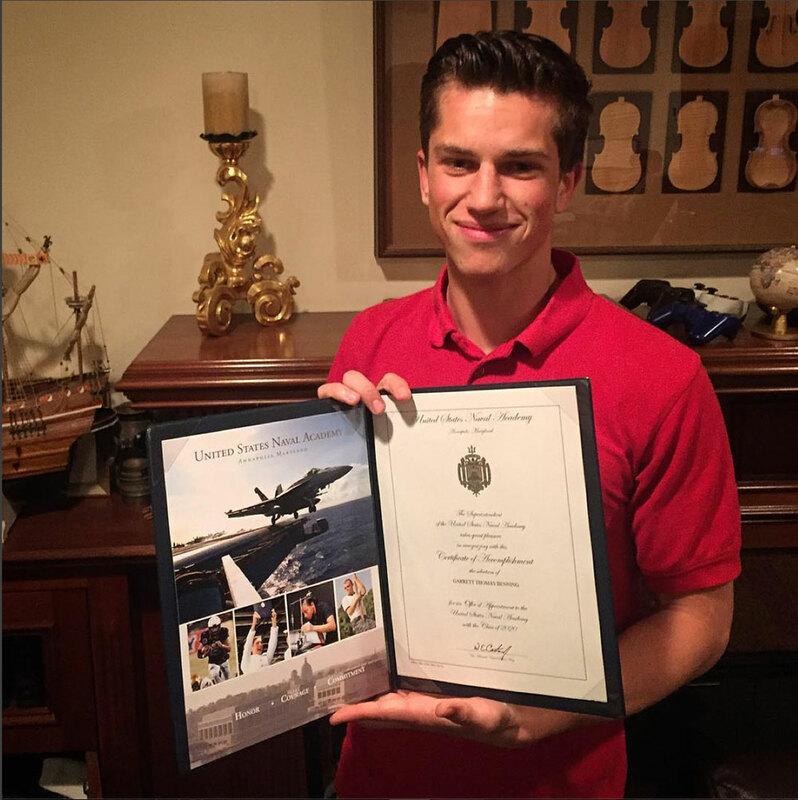 Our very own Garrett Benning - oldest son of preeminent violinmaker Eric Benning and grandson to renowned luthiers Nancy and Hans Benning - has been accepted into the United States Naval Academy. 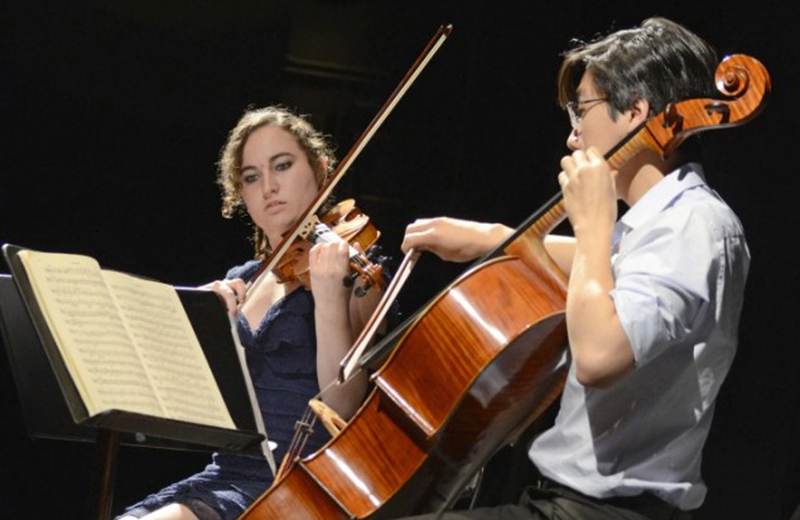 STUDIO CITY | Fourteen-year-old Nathan Benning cradled a violin 14 months in the making, fitted it to a freckly chin, then launched into a deep and resonant minor violin concerto. 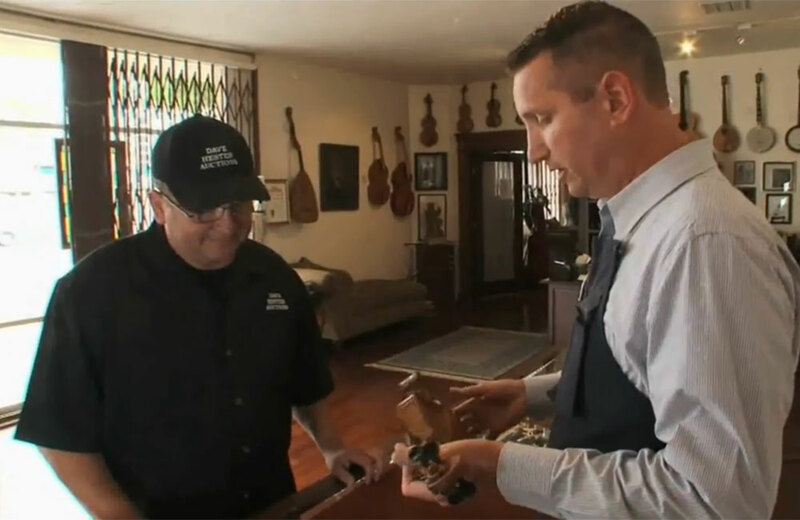 Issac Salchow brings his passion and expertise to Benning Violins' storied Los Angeles violin shop. 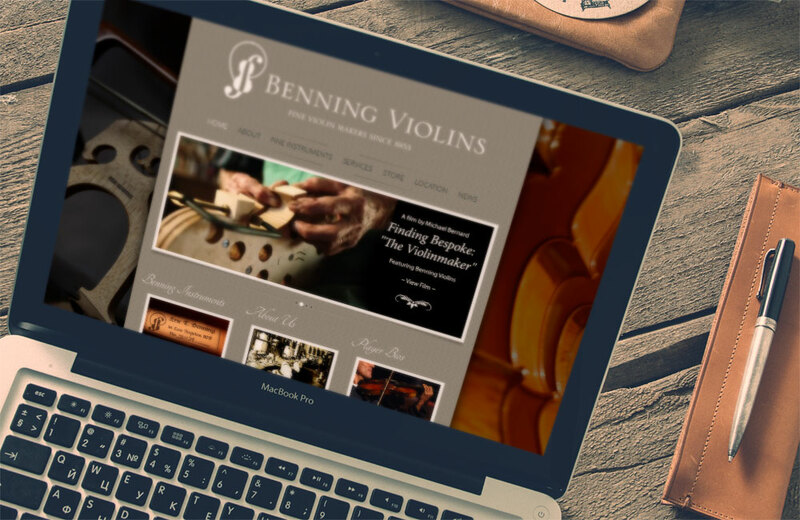 Benning Violins, a family business since 1953, continues to carry on their reputation specializing in violins, violas, cellos and bows. Kansas City Symphony principal second violinist Tamamo Gibbs has acquired a 2005 Stradivarius model violin crafted by renowned violinmaker Eric Benning. The instrument, crafted in 2005, was made in collaboration with celebrated luthier Carl F. Becker. 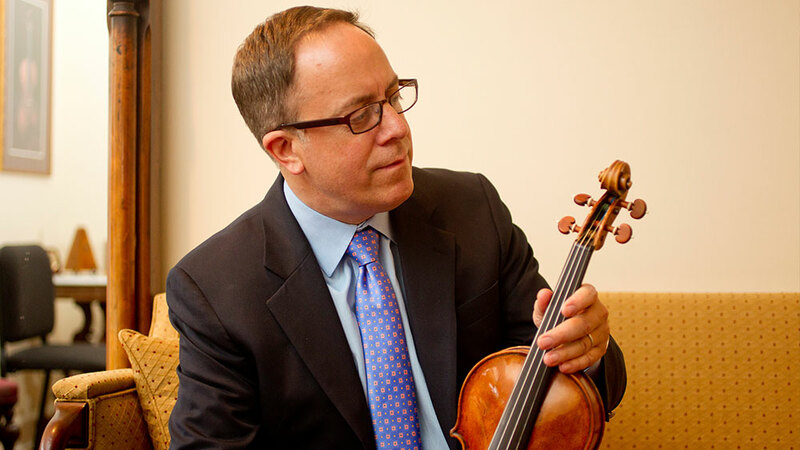 Mark Gibbs, principal cellist of the Kansas City Symphony, has acquired a cello crafted by distinguished Los Angeles violinmaker Eric Benning. 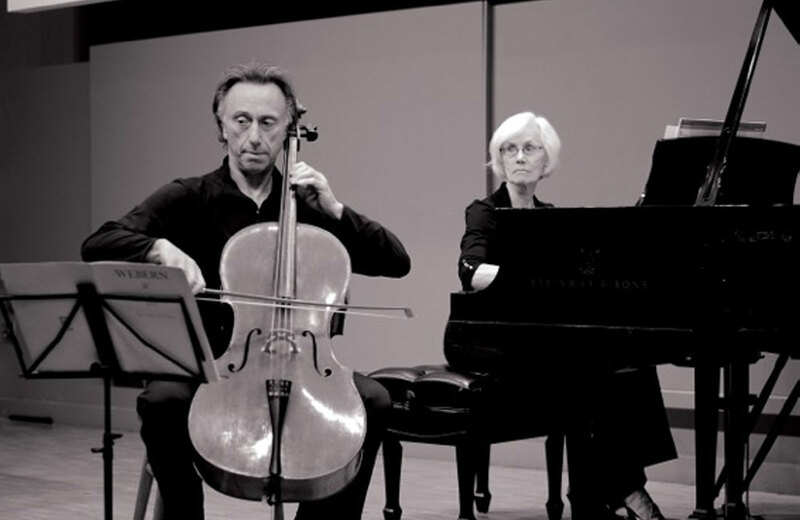 The instrument, crafted in 2008 after a Stradivarius cello, possesses, according to Gibbs, a “rare combination of traits”. 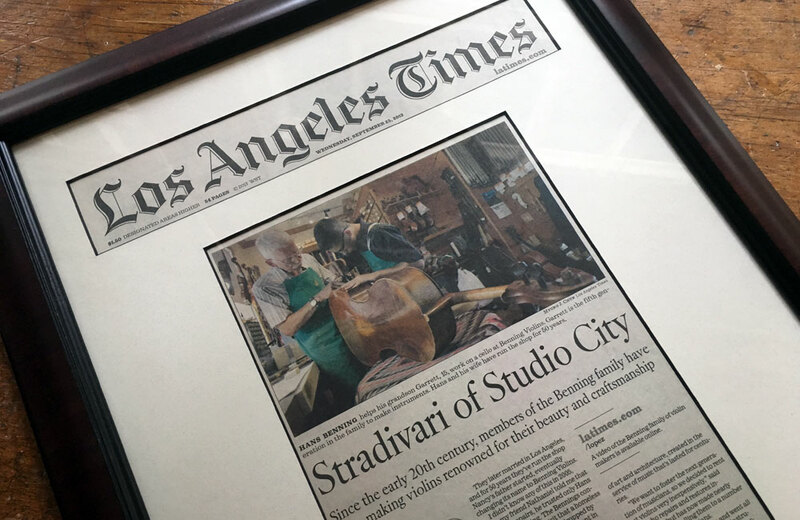 Director, cinematographer and filmmaker Michael Bernard has released an original short film chronicling the story of the Bennings, the family of distinguished violinmakers based in Los Angeles. 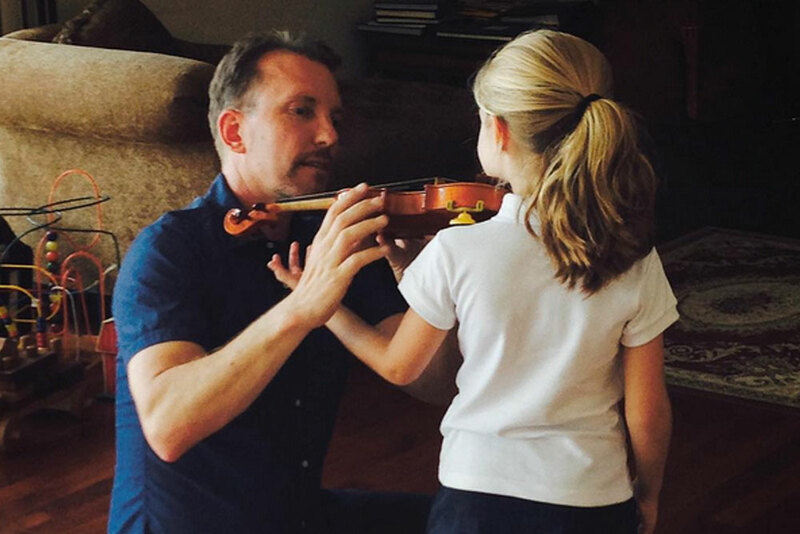 Violinist Clayton Haslop, widley recognized teacher and performer, has acquired a violin crafted by Los Angeles violinmaker Eric Benning. 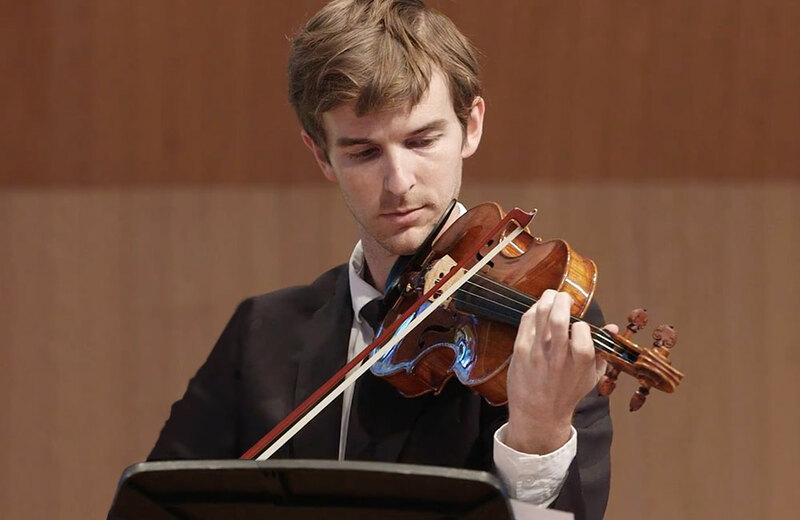 Los Angeles-based violinist Alex Granger will perform a violin concerto in San Francisco written expressely for him by composer Lucas Floyd. 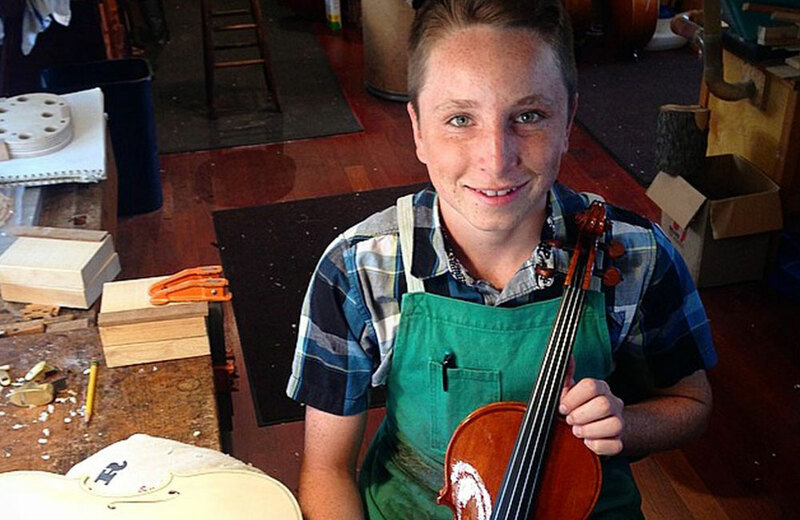 Nathan Benning, a 14-year-old violinmaker has completed his first instrument, a violin crafted after a Stradivarius model. 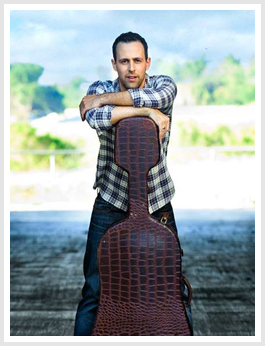 Nathan, son of preeminent luthier Eric Benning, is a 4th generation maker at Los Angeles-area violin shop, Benning Violins. 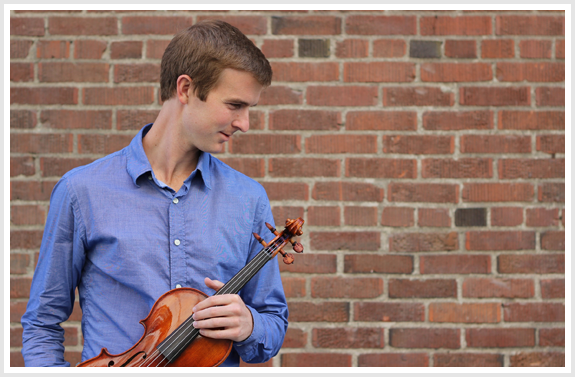 On April 27, 2014, violinist Alex Granger premiered American composer Lucas Floyd's violin concerto in San Francisco Conservatory of Music's Sol Joseph Recital Hall. 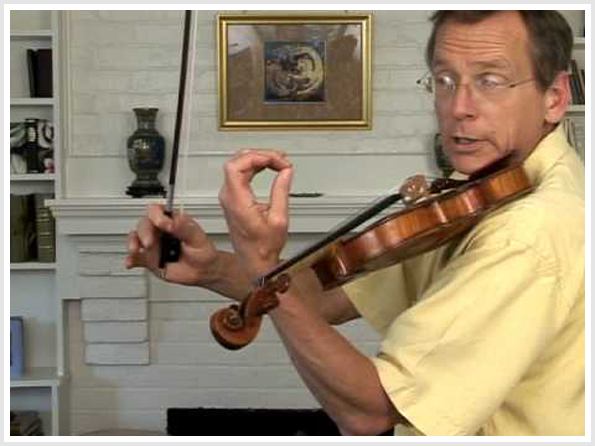 The concerto was performed on a 2010 violin crafted by master Los Angeles violinmaker Eric Benning. 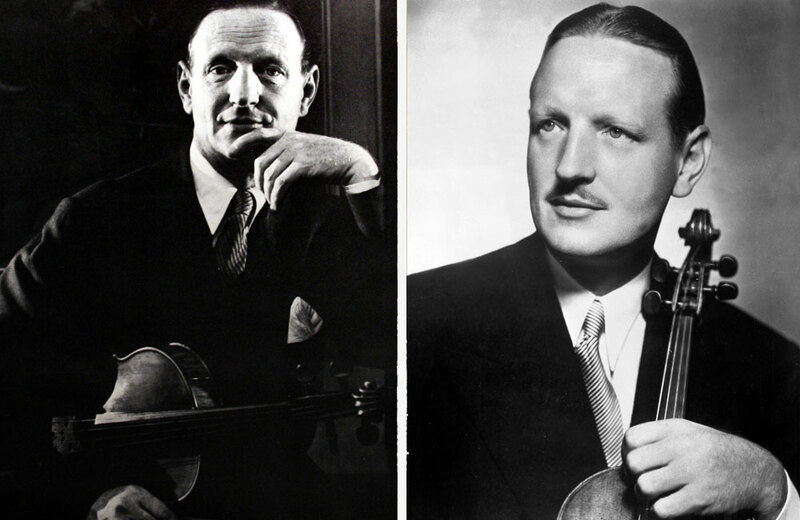 Los Angeles violin shop will host a three-day exhibit of fine violas coinciding with the Primrose Viola Competition. 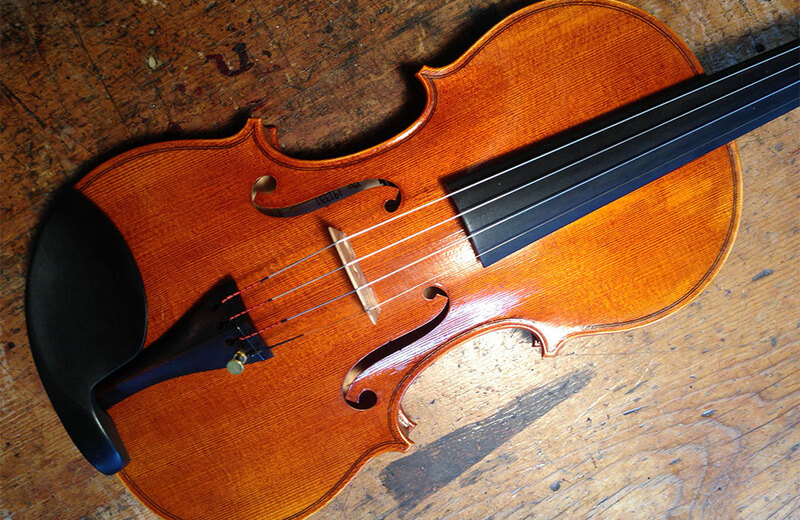 "The Viola: An Exhibition of Sound, Form and Beauty"
Nathaniel Ayers was shy in our first encounter a few months ago, if not a little wary. 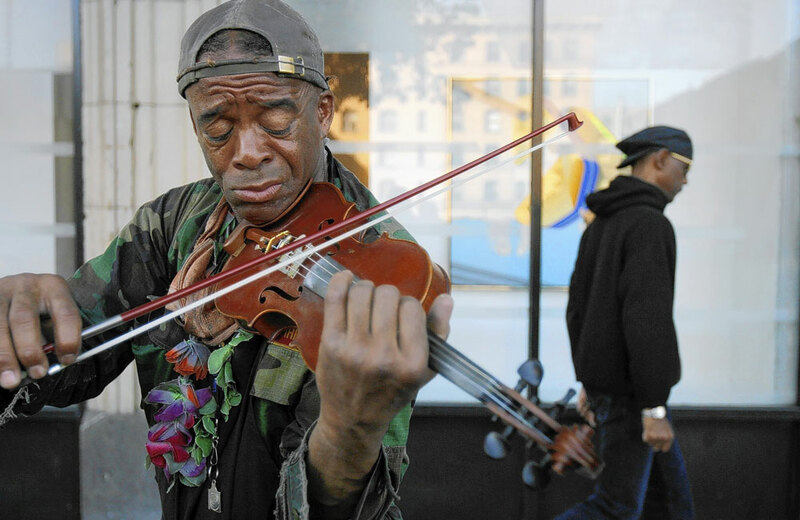 He took a step back when I approached to say I liked the way his violin music turned the clatter around downtown L.A.'s Pershing Square into an urban symphony. 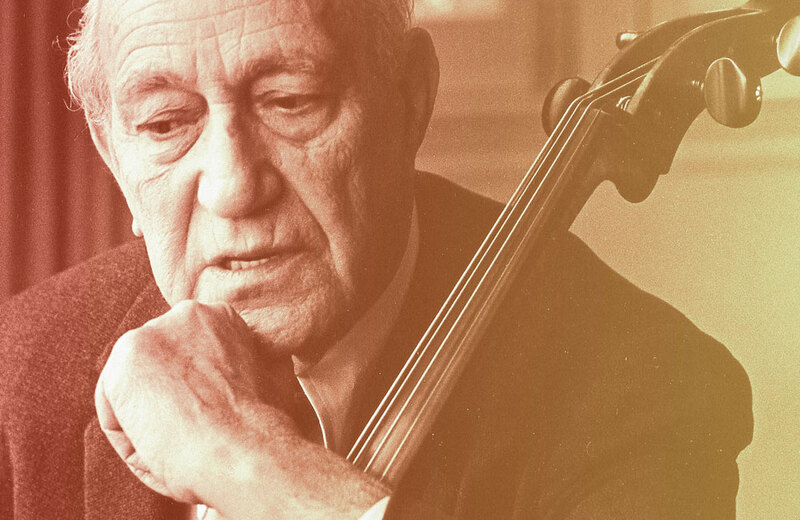 Renowned conductor and cellist Ronald Feldman, has acquired a newly crafted master cello made by distinguished Los Angeles violinmaker Eric Benning. 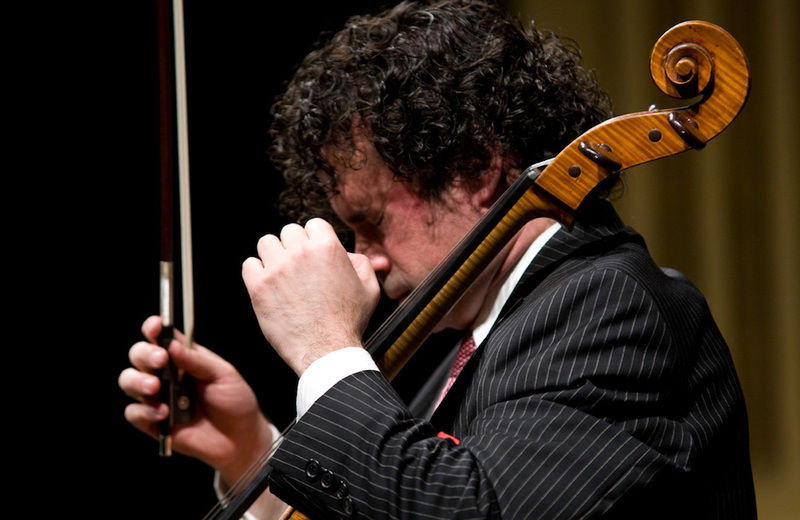 The cello, crafted by Benning in 2013 and modeled after a noted Stradivarius model, is, according to Feldman, “a joy to play”. 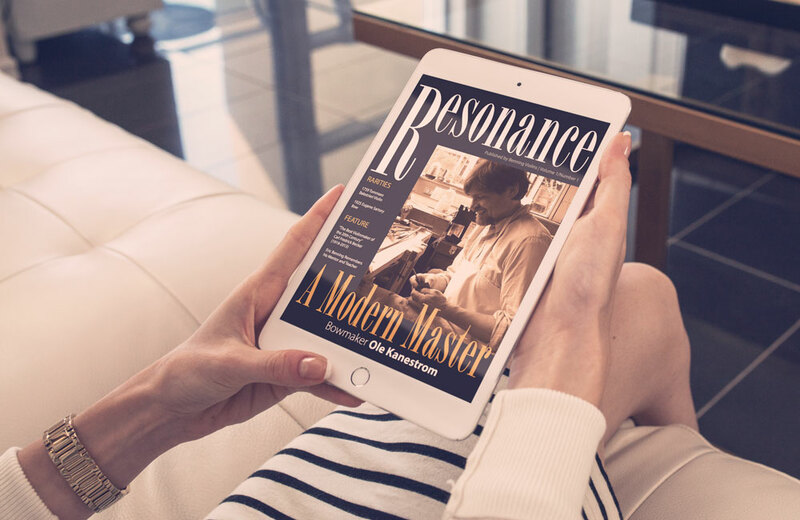 Benning Violins, the renowned Los Angeles-area violin shop that has been a mainstay musical institution on the West Coast providing service and sales of fine instruments, has announced the publication of their quarterly online magazine, Resonance, with its inaugural issue published to its subscribers in September 2013. 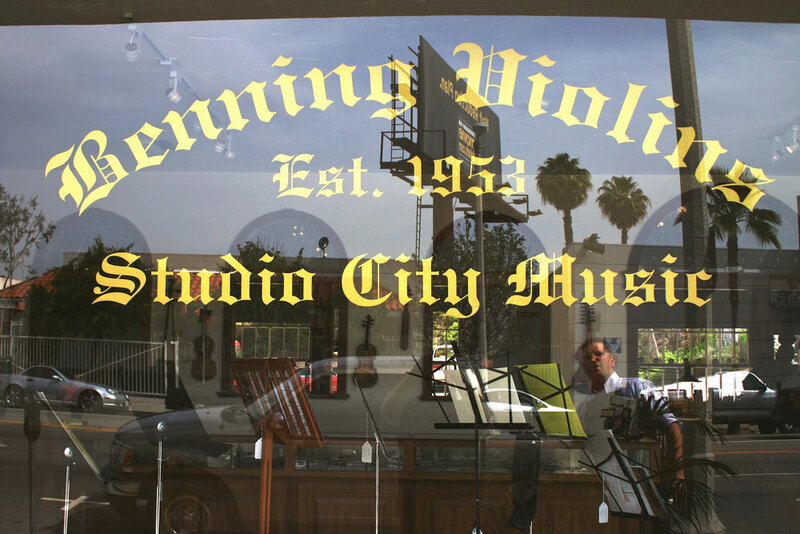 Benning Violins, the distinguished Los Angeles-area violin shop that has served string players – from beginners to professionals – since 1953, has announced an April 28 open house to celebrate 60 years in business. The celebration will feature exhibits, hors d’oeuvres and live performances by Benning instrument owners. 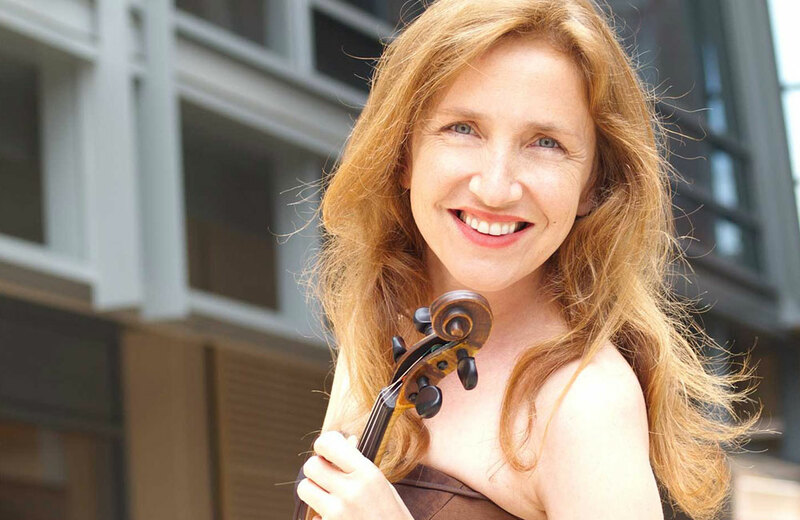 Renowned Los Angeles-based violin virtuoso Aleksandra Maslovaric, has acquired a master violin crafted by luthier Eric Benning. 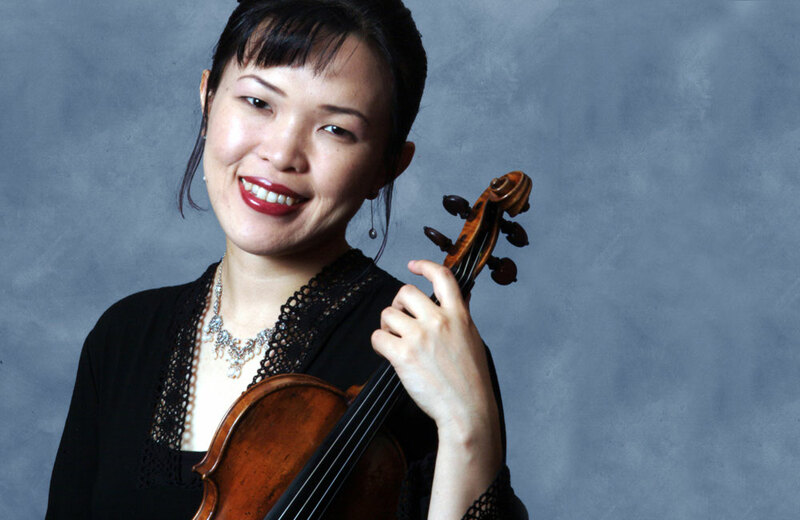 The violin, made by Benning in 2009 after a celebrated Stradivarius model, will be used to record the violinist's next recording of classical works written by women composers. 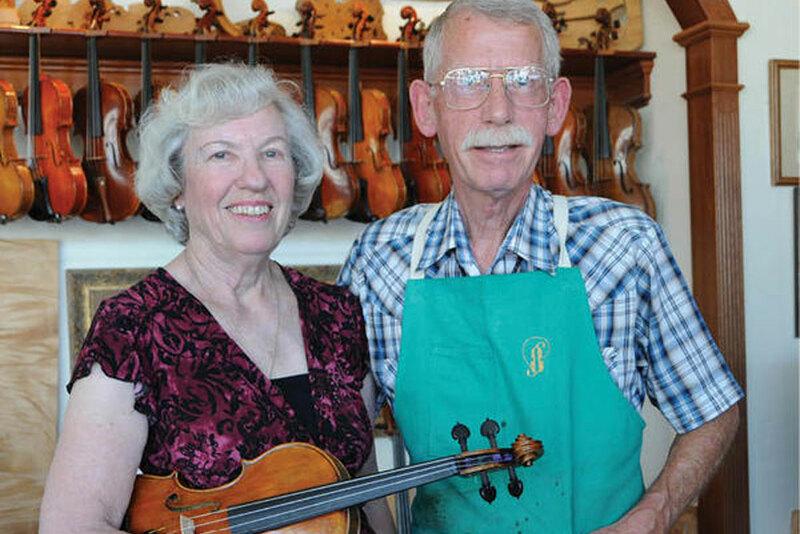 Benning Violins, a distinguished Los Angeles-area violin shop that serves string players from beginners to professionals, has announced a part-time resident partnership with renowned master bowmaker Ole Kanestrom. 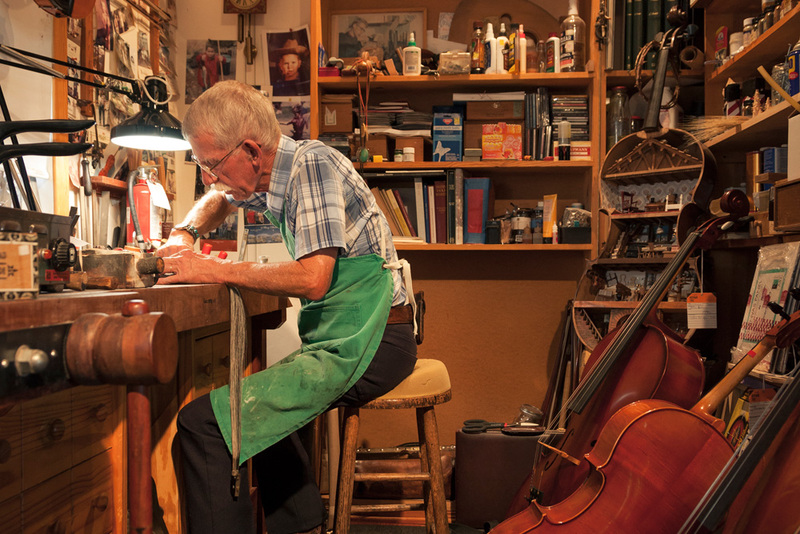 Kanestrom, who runs his own successful shop in Port Townsend, WA, makes and repairs fine bows for violins, violas and cellos. 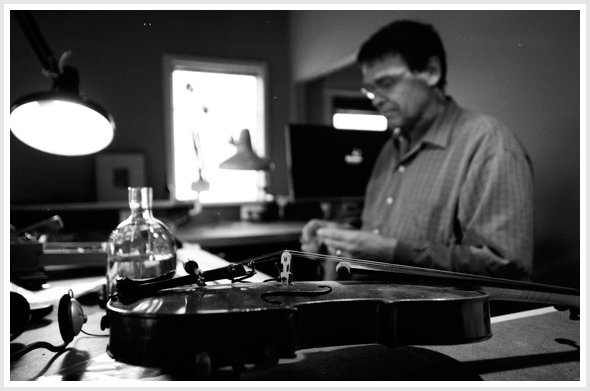 Eric Benning, distinguished violinmaker at Los Angeles-based violin shop Benning Violins, is one of almost 50 modern master violinmakers chosen whose finely crafted instruments went on exhibit in New York at the second annual Contemporary Violinmakers Exhibition. We would like to congratulate violinist Vincent Houser on his recent purchase of a Stradivarius-model Violin crafted by Los Angeles violinmaker Eric Benning! Vincent is a former student of Jascha Heifetz, Performing Arts Chairman at Buckley School in Sherman Oaks and Orchestra Director for "Art Deco" Orchestra among many other "hats" he wears. 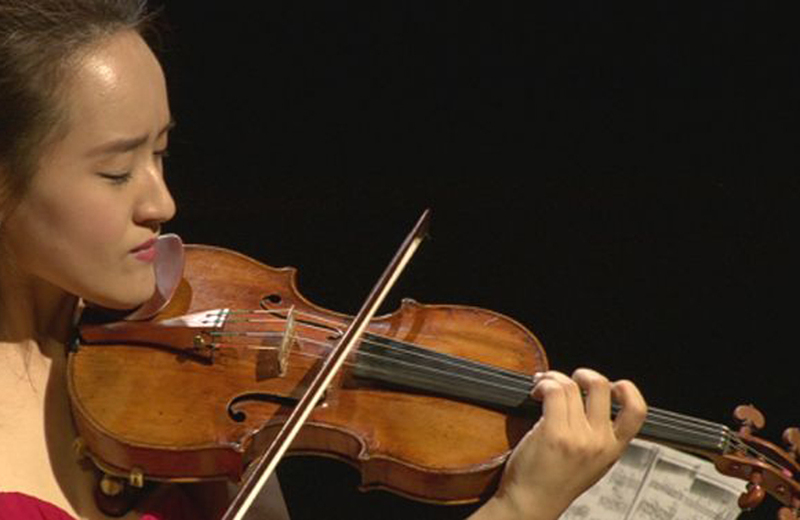 Congratulations to violist Taisiya Sokolova for her acquisition of the most recently complted viola crafted by Los Angeles violinmaker Eric Benning. 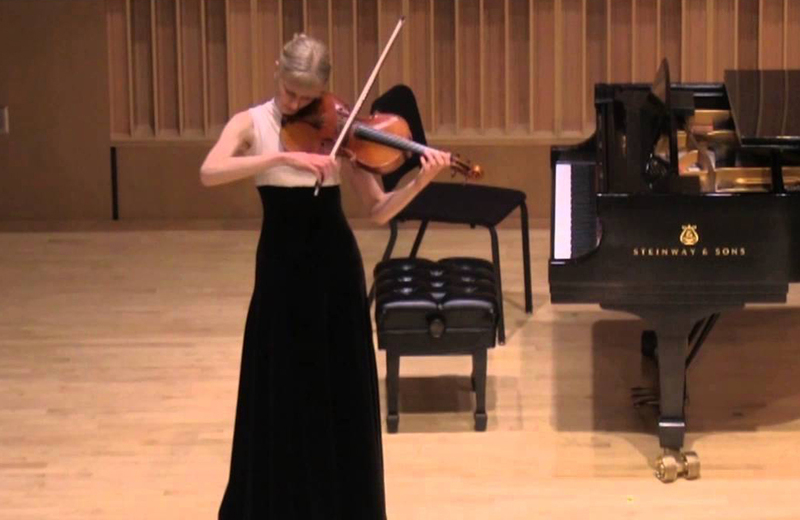 Taisiya has been studying with Paul Coletti at the Colburn School. She resides in Moscow, Russia, so it is exciting to have one of Eric Benning's instruments residing in such a storied locale. Benning Violins would like to congratulate cellist Jeffrey Ho of Santa Monica on his recent acquisition of a cello crafted by Los Angeles violinmaker Eric Benning. 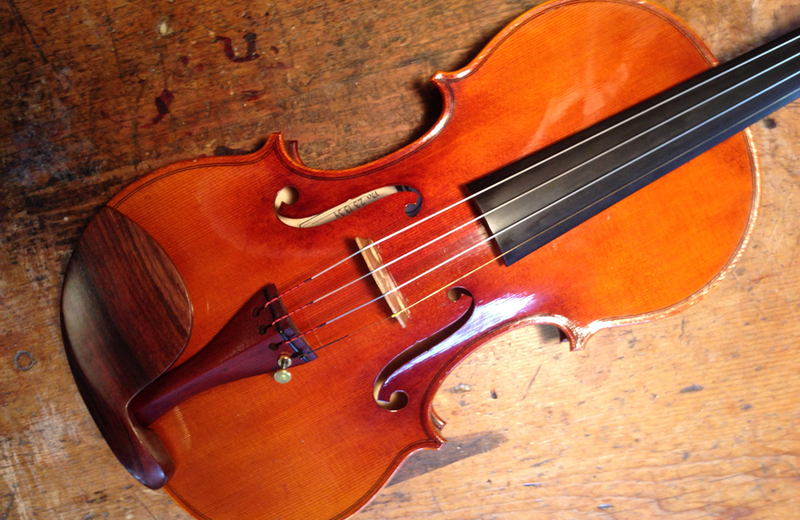 This particular cello - a Stradivarius model - was only recently completed by Eric. 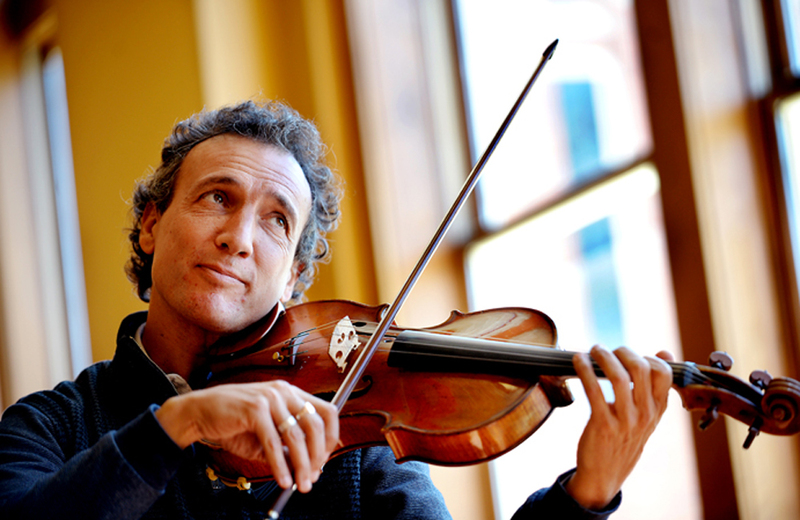 Distinguished violist Paul Coletti has acquired a viola crafted by Los Angeles violinmaker Eric Benning on behalf of The Colburn School. 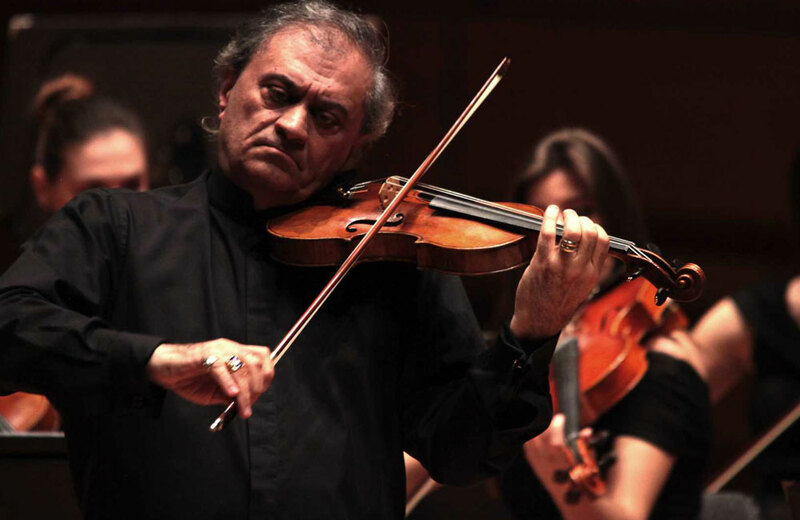 Violinist Tito Quiroz performs for President Filipe Calderon in Ensenada, Mexico. 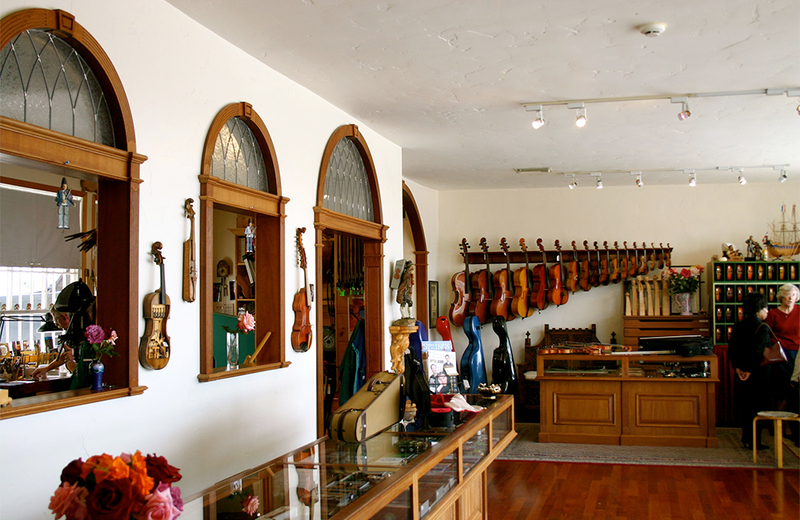 UPDATE: 5-10-2012 - The cello has since been sold and Beare Fine Violins has since closed their New York shop. 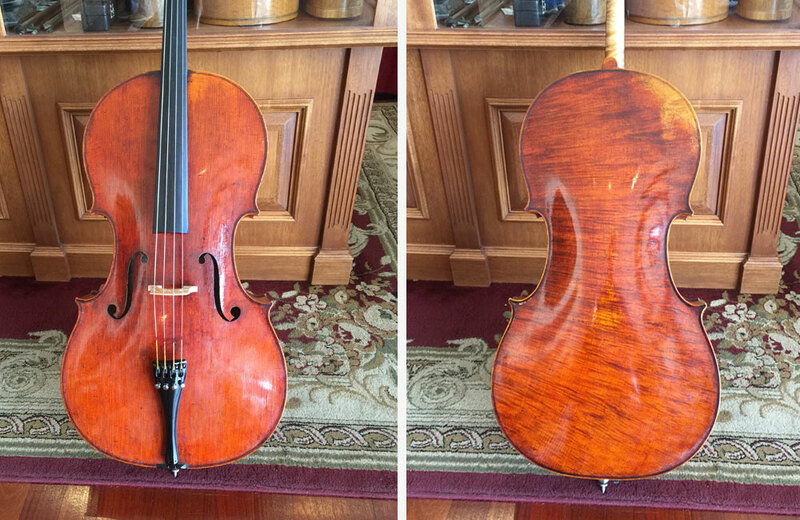 Cellist Victor Lawrence has acquired a fine cello crafted by violinmaker Eric Benning. 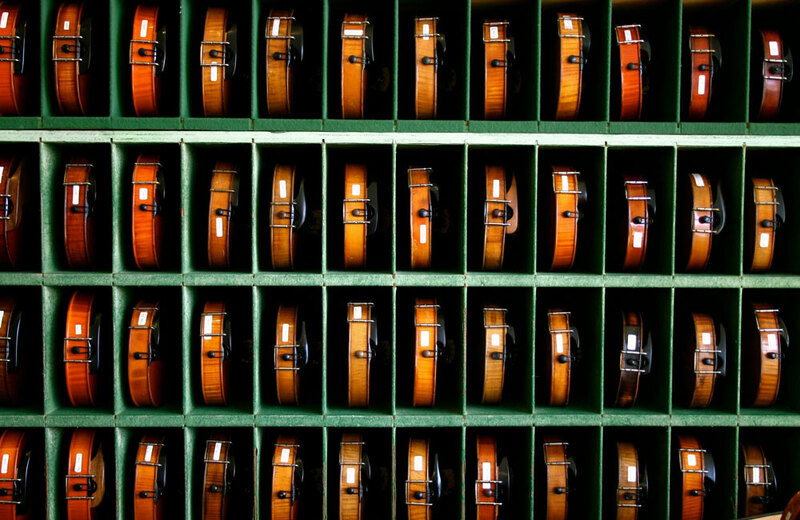 Eric has earned an international reputation making violins, violas and cellos at his Los Angeles violin shop, Benning Violins. A native of New York City, Victor is currently residing, teacing and performing in Los Angeles. 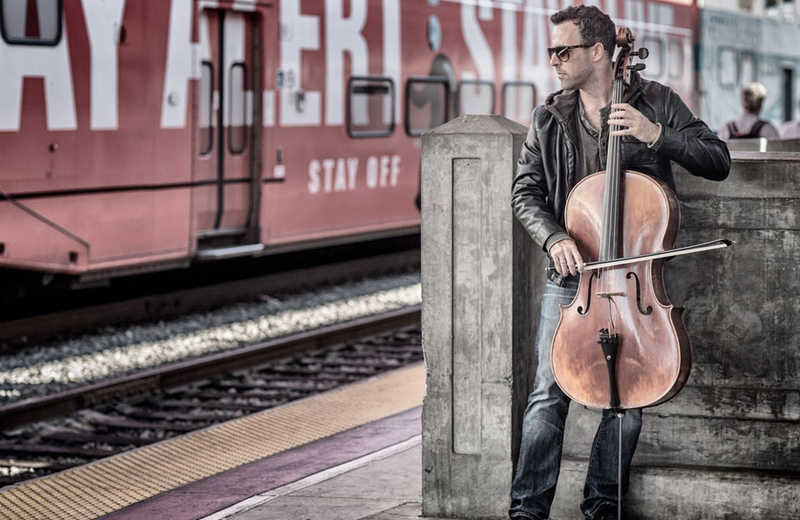 Cellist Armen Ksadjikian will be performing with the California String Quarter with a fine cello crafted by Los Angeles violinmaker Eric Benning. Sunday September 13th at 2 pm. 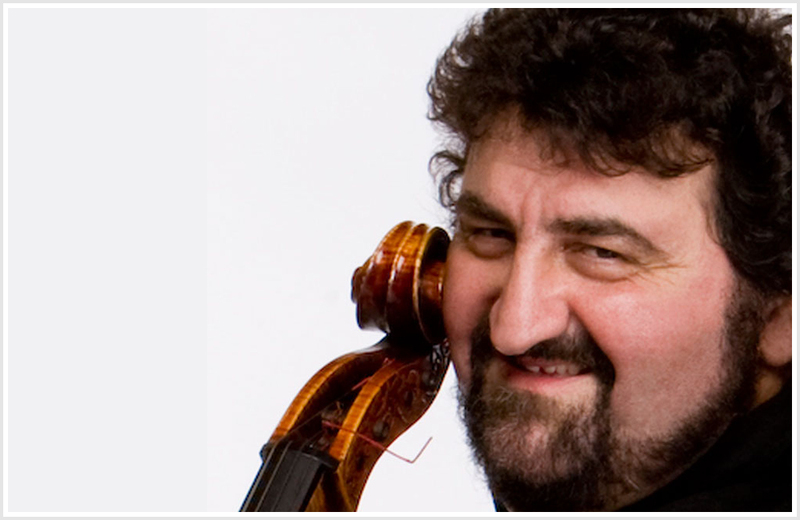 Armen Ksadjikian will be joining the California String Quartet in their Sunday Concert Series. 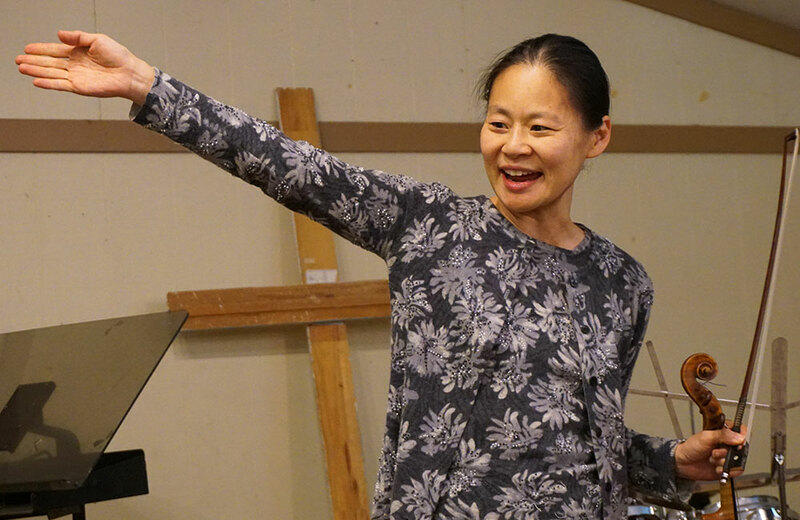 Chinese born violist, Silu Fei, becomes the latest owner of a violin crafted by Los Angeles Violinmaker Eric Benning. 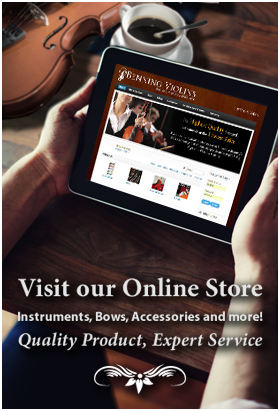 Latest Stradivarius model violin crafted by Eric Benning, is now available in New York at the violin shop of Julie Reed. Please contact her studio for availability. 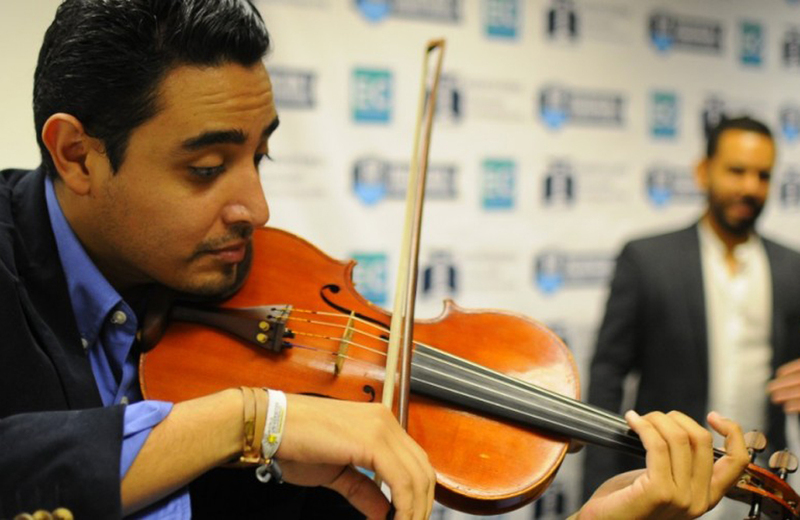 Los Angeles-based violinist Michael Garcia has purchased Eric Benning's first violin - the "ex Raymond Wurfl" - crafted by Eric from age 8 to 11. 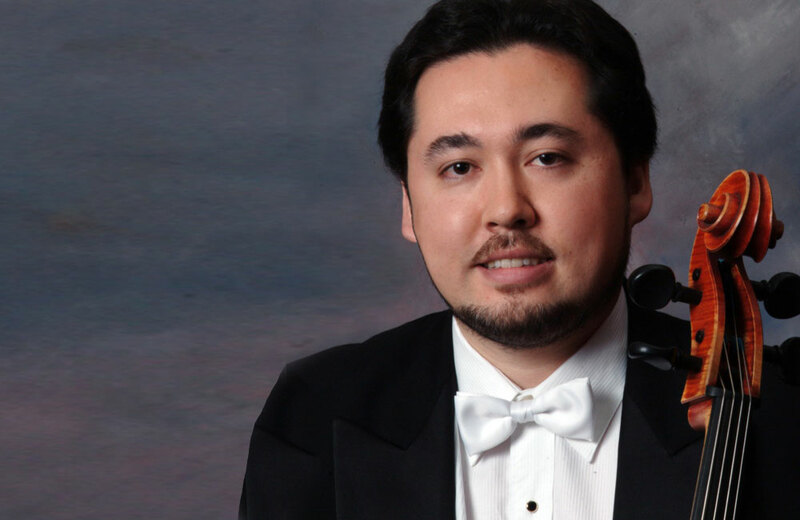 Michael studied with Sidney Szathmary, Principal Violinist of the Indianapolis Symphony, and has performed as a member of both the Symphony of the Verdugos and the West Valley Symphony. 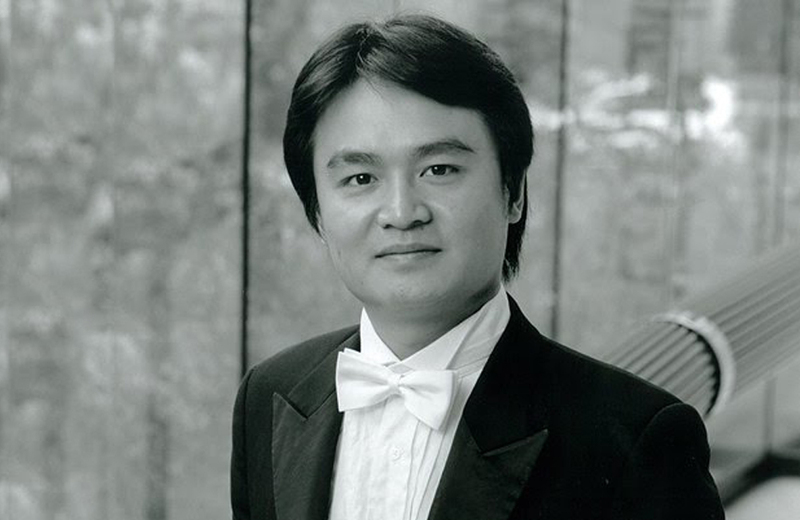 Congratulations to Gahyun Cho for making the finals in the Berlin International Max Rostal Competition for Viola and Violin! 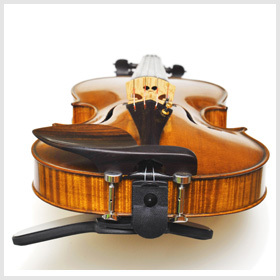 Gahyun is playing on the a Tomaso Balestrieri-model violin crafted by Los Angeles violinmaker Eric benning. Benning Violins would like to congratulate and welcome cellist Jacob Szekely to the growing list of great musicians who are playing on Eric Benning's instruments. Jacob has purchased the latest Benning cello made on the Stradivarius model. We at Benning Violins wish him many years of enjoyment with his new cello. 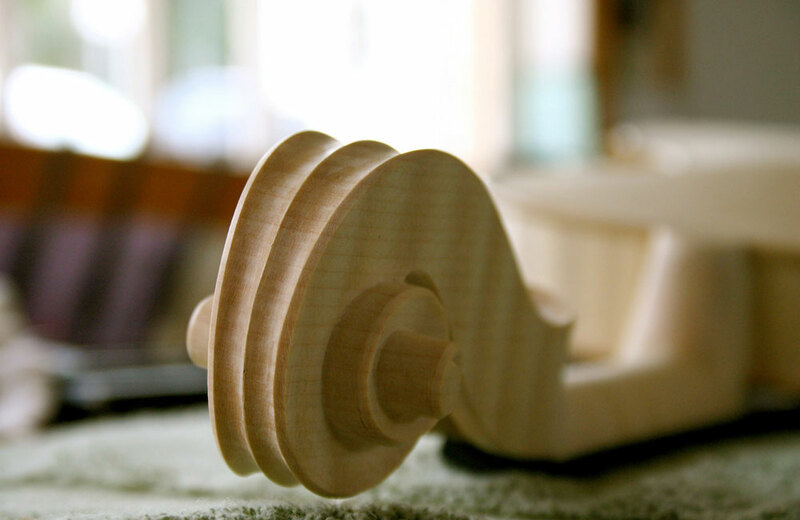 Hans Benning sits in his shop, applying a finger plane to the backside of a cello. He taps the wood, cocking his ear to hear the dull thump of mountain-grown maple.